Just inside the beautiful structure of the GET ARENA, you will find Goonies Kids which is a recommended place of fun for your beloved kid; This outfit has fun-filled packages for all ages (toddlers to big kids). Its a great place for your kids have their everyday fun as they will surely love the age appropraite games, climbing walls, rides, prixes, food and entertainment. Special Occassions such as birthdays, play groups and school fundraising events always come with some extra fun at this safe environment (Goonies Kids Center). 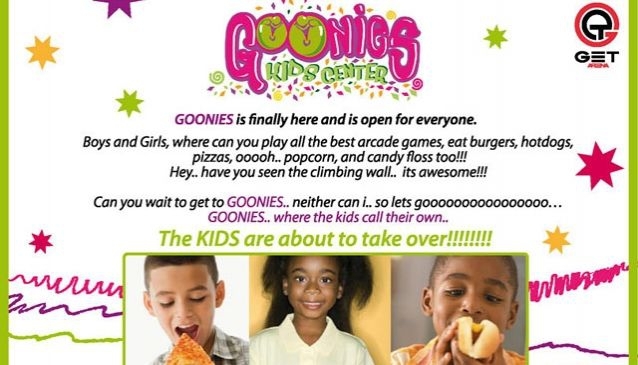 Of course its no news every child deserves the best, Goonies kids is a wonderful place for your kids to play, laugh and enjoy being kids.